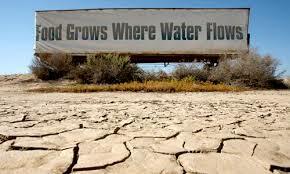 How California’s Drought Affects the World Far-reaching effects of California Drought This is an excellent You Tube video! This is a MUST READ ARTICLE, the best and most comprehensive report on the topic of drought in America that I have read so far! Click on the first story. Egypt, which represents the world, suffered 7 years of drought and famine. But Egypt had a deliverer, sent by God, who spared Pharaoh and his nation and saved the ancestors of the Jewish nation. Hallelujah! America has rejected God and His Word. “Homosexuality is out of control, rampant sexual immorality demanding to be accepted as normal and the society rushing to affirm that acceptance, a massive moral disaster”. Is it any wonder that America has been abandoned by God? This is a portion of a timely message by Dr. John MacArthur. America has been abandoned by God, and we have been left to wallow in the sexual perversions of the depravity of the human heart. Truth is the ONLY solution. Repent America, and take heed to the Word of God. A famine of hearing the Word of God will never produce revival. Ministers, take a stand for truth no matter what it may cost you!